Frugal and Thankful: Strawberry cake with ricotta and cream cheese frosting. 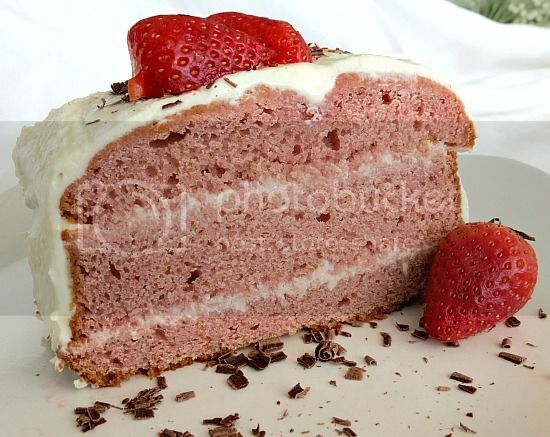 Strawberry cake with ricotta and cream cheese frosting. I scored two 1lb. boxes of strawberries for only $1.50 at a local store the other day. We ate one but I wanted to use the second one to make something special. And yes, I couldn't wait the whole week until Valentine's Day, so I just made it last weekend :) Say hello to strawberry cake with ricotta and cream cheese frosting. Preheat oven to 350F. Grease your form(s) with butter and line them with parchment paper (I could, probably have just flour them but I didn't wanna risk it). Hull strawberries and puree in a food processor. I used the whole box (16 oz.) to get the amount of puree I needed. Separate the eggs. In a big bowl beat together egg yolks with sugar for a minute at medium speed, then add butter, vanilla, yogurt, jello, milk and 11/2 cup strawberry puree, one at a time, and continue beating until well combined. In a separate bowl sift flour, cornstarch, baking powder, salt and soda. Gradually add to wet ingredients mixing constantly. 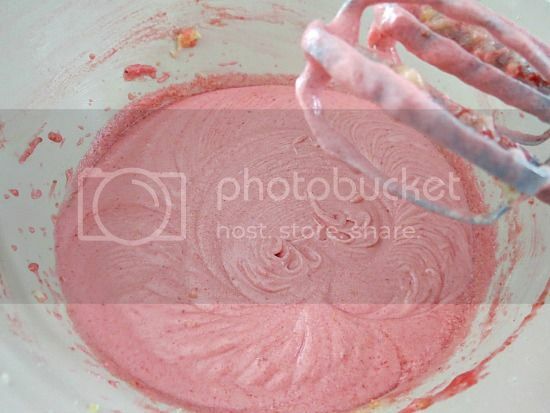 Whip egg whites until white and stiff and gently fold into the strawberry mixture. Pour into prepared forms and smooth the tops. I used bread forms because I wanted to make two smaller cakes but two basic round forms would work perfectly too. Bake for 30-40 minutes or until a toothpick inserted in the center comes out clean. It takes longer in bread forms. Let cool in pans for 10 minutes. Remove and cool completely on wire racks, for at least an hour. In the meantime, beat together all the ingredients but strawberry and lemon juice for the frosting. Separate 1/3 of the mixture. Add 2/3 tsp. of lemon juice and strawberry puree to it and mix well. Add the rest of the lemon juice to the white frosting. 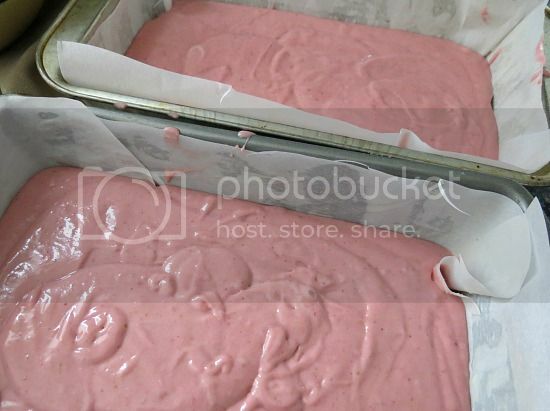 Once the cake has cooled, frost the middle with the pink mixture, and the top and the sides with white. Cool in the fridge for at least three hours, even better overnight. Garnish with fresh strawberries and chocolate. This amount of frosting was barely enough for my two cakes but should be perfect for a round two-layer kind. Strawberries and cream cheese. How could you go wrong? Looks delicious. Oh, wow! That looks fantastic! I love cheese-type icing. That cake looks super moist too. Yum yum! Oh my word that looks so good. It looks delicious. That batter is pretty. I never heard of ricotta in frosting. I will have to try it. This cake looks so good and pretty too! I was reading your post on the Olympics...and I have been mesmerized by the Russian ice skaters! Perfection! And I can't help noting that they don't have the smugness and over-(false) confidence of the Americans...we Americans do tend to have some faults here. Also, I kind of had the thought that the news stories coming out on the facilities were slanted on purpose. There are some opinions of that countries' leader that I agree with. I pray for his conversion to Christianity. Will pin for when strawberries are in season.